The spacing determines the size of the tube. For a more subtle finish use spacing which is closer. Cut a 10 1/2 inch x 6 inches rectangle and mark at 1/2 inch intervals. There are two kinds of stitching for this pattern. They alternate along each row of smocking. The first type is when you pull two stitches together as per a and b on the diagram. 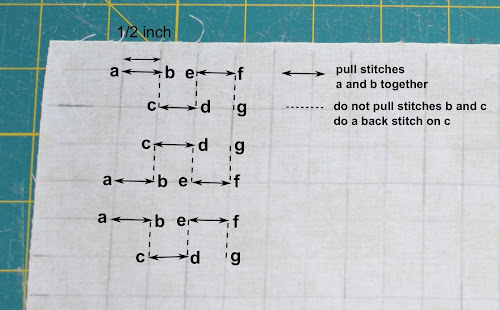 The next stitch is when you go from b to c but do not pull the stitches. In this case you double stitch on c so that there is no pulling. This is the first example where you pick up a and b and pull together. After pulling the stitches together, do a double stitch before moving on to c.
With your needle pick up c without pulling. And so on following the diagram above. As you go you will see the pattern emerge. When finished, stretch the rectangle on a padded surface and pin well. Slightly crush the tubes with your fingers to obtain a more rounded shape. Apply steam with the iron touching the tubes but without pressing. Let it dry. When dry trim to 5 inch squares. Stitch and the block is done. This is the 21th block in a series of 25 exploring texture in fabric. This is just as exciting to see as the others you’ve worked. I’m so impressed by the thought that went into the creation of these lovely textural quilting blocks. Cant wait to see the whole front panel. Will you make this again? Thanks. Make another quilt like this one? Maybe not. For me the purpose of this quilt was to try a few sewing techniques that I’d never done before and that I may use in other projects individually.